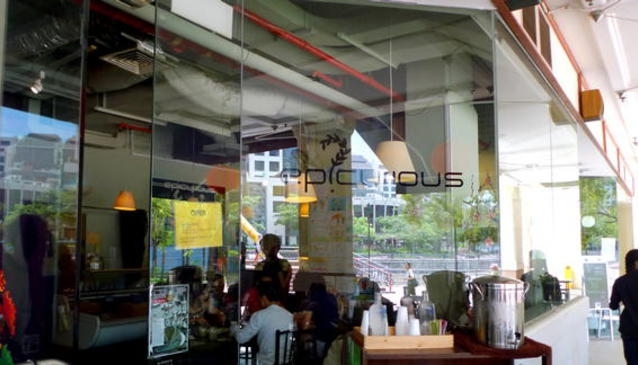 Just opposite the colourful Alkaff Bridge on Robertson Quay, Café Epicurious is well sought after for its proximity to Singapore River, its home-made, reasonably priced food, and friendly service. In fact, it is a known fact among regulars that it is almost impossible to get a seat should you get there around mid-day. Her the ambience is totally laid-back with plain water served on recycled bottles of Absolut Vodka and fresh juice poured in some 'Bonne Maman' jam jars. Café Epicurious offers some decent brunch items, including pancakes, French toasts and breakfast burrito. The specialties here: 'Green Eggs and Ham', 'Ratatouille Omelette' and Sunday Egg Curry only available on Sundays, which are 2 hard-boiled eggs cooked in a mild vegetable curry and served with crispy roti prata. For the big hunger, the 'Full Monty' will do and for the healthy conscious, have a freshly squeezed orange, carrot or celery juice.